We all sweat for a reason but when the sweat emits bad odor you know that the time has come to start searching for a good perfume or a deodorant. He Perfumed Body Sprays are specially made to help you stay fragrant and fresh for all day long. A wave of fresh marine rising from the base notes of amber and musk, He Magician is for the man who is never caught off guard.Formulated with skin friendly ingredients it gives pleasant fragrance which instantly elevates your mood. Feel confidant, macho and full of vitality with this body spray as the fragrance lingers around you for whole day. Does not harm your skin or stain your clothes. With sound judgement and quick thinking, the Magician is the expert problem solver the world is lining up to meet. Explore the entire range of Deodorants/Roll-ons available on Nykaa. 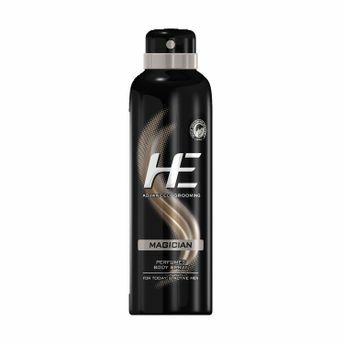 Shop more HE products here.You can browse through the complete world of HE Deodorants/Roll-ons .